When I started My Book Retreat almost a year ago, I did so mostly to keep track of my reading. This was prompted by a challenge hosted by Katrina at Callapidder Days. Well, the year has passed and once again I'm joining in Katrina's Fall into Reading challenge. I'm already reading Saving Max, but I haven't made it very far. I do have one other goal for this challenge: to read a total of 20 books by December 20th. I only have 11 on my list, but I have plenty more to be read. There are a few books that I had on my Read Your Own Books (RYOB) challenge that aren't on this list, so I hope to get to those. I've also bought or won several other books this year that I'd love to sit down and read. And I'm sure I'll be offered more for review that I just can't decline. There are far too many good books out there that must be read! What are you planning to read this Fall? Head over to Callapidder Days to join the Fall into Reading Challenge! I enjoyed The Kitchen House and I am reading Little Bee right now. I love the way it is written even if the subject matter is difficult. Good Luck on the challenge. Not familiar with these books, but enjoy your reading! 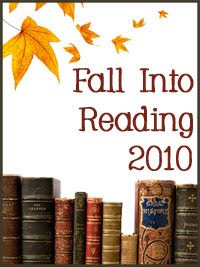 Good luck with your fall reading! You have some great books on your list...quite a few that are on my tbr list! Good luck and I'll be back to see your updates!!! Thanks again for hosting the summer reading challenge! I haven't read any of these! I was looking at Little Bee in the bookstore not long ago, though -- looks like a good one. Thanks for being part of FIR '10! Great list. I started my blog to keep track of what I was reading and to remember what I thought of the books I read. It sort of exploded after awhile. But, I love it. I've found so many new books to read and made so many new friends.